Some commercial refrigeration systems have one condensing unit, associated with two or more evaporators, Fig. 3-10, repeated (two or more) evaporator refrigeration systems are usually used in commercial refrigeration systems. Liquid refrigerant (dark red), flows through the thermostatic valves for evaporators. 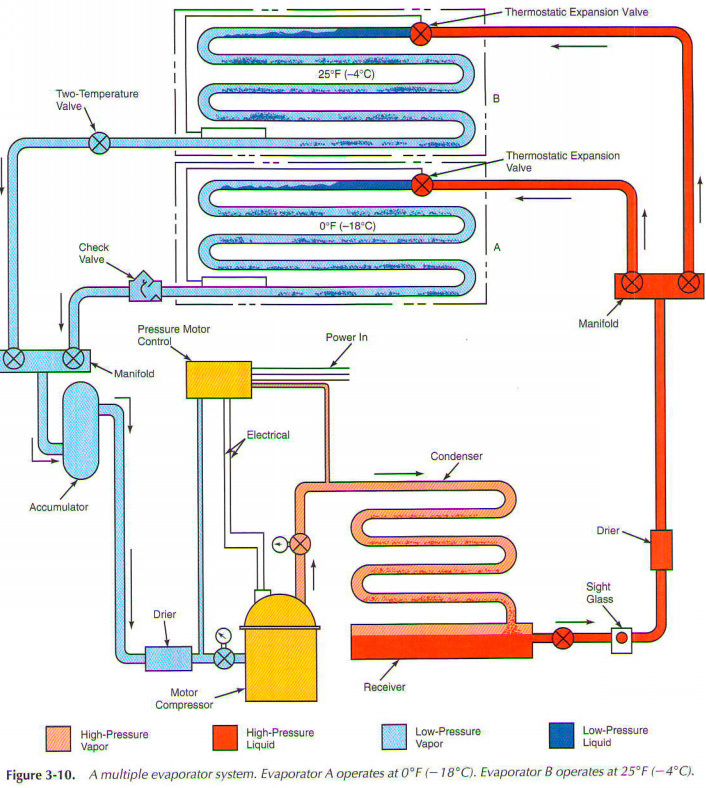 Evaporators may have the same or different temperatures of the evaporator. If the evaporator temperature is the same, the system uses only the low side of the float, or TEV to control the refrigerant. If two or more evaporating temperatures are desired (frozen food temperature and the temperature of the cooling water, for example), the device must be used to keep one of evaporators for a lower external pressure. Look at the diagram (Fig. 3-10). Two temperature valve in the suction line (top left) keeps low pressure liquid refrigerant (dark blue) and steam (light blue) In the evaporator at a higher pressure than the evaporator evaporator temperature is regulated by evaporating pressure. The lower the pressure, the lower the temperature. Non-return valve is located in the suction line coming from the evaporator cooler, and This prevents warmer, high-pressure, low-side pairs (light blue) and the penetration of cold evaporator, during the off cycle. Sight glass (fluid indicator light) is often included in the liquid line. A technician can use it to see if there are enough of refrigerant in the system, the Bubbles will point to the lack of refrigerant. This system, as shown, pressure motor control. Working pressure is taken with the low side of the system. Line high-pressure side is also included motor control. It works safety device which stops the motor if the condensing pressure (high side) is too high.